The Miller® Bobcat® 225 with GFCI (Ground Fault Circuit Interruption) is a 225 amp AC/DC welder and 11,000 watt generator. It comes standard with two 120 volt duplex receptacles with GFCI protection. The 225 is powered by a twin cylinder Kohler 23.5 horse power gasoline engine and has a 12 gallon fuel capacity for longer run times. Long Run Times - Large 12-gallon fuel capacity means many hours of run time before refueling. 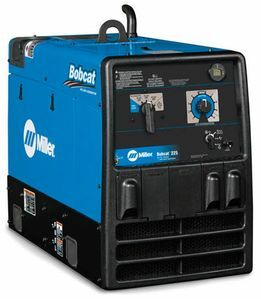 Miller Bobcat 225 w/GFCI 907498 can be used to mig or tig wld aluminum but it is not a good choice to do so. You can do non critical aluminum tig weld with the 225. You will need a HF 251high frequency arc starter. . The 225 does not have remote amperage control capability so you will not be able to use a footpedal control or hand remote control. 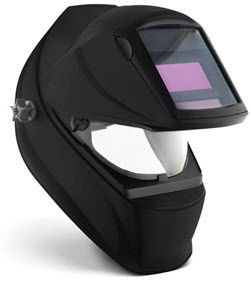 Your best option would be to use a tig machine with the Bobcat acting as a power source.